We are excited to present two workshops at the Explore the Outdoors Expo in Grand Junction on February 9th and 10th, 2019. This will be especially fun because the nearby Grand Mesa, Uncompahgre and and Gunnison National Forests are some of our favorite places to hunt! 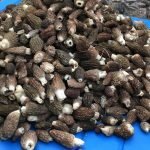 Plus, several major forest fires from the 2018 fire season promise burn morels in Colorado this morel season. 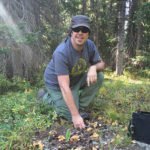 Learn to find choice edible mushrooms in Colorado’s high country: porcinis, chanterelles, morels & more. Did you know that Colorado is home to a natural bounty prized by chefs everywhere? These native culinary delights live at about 10,000 ft in coniferous forests all around us – wild mushrooms! Trent & Kristen Blizzard will open your eyes to our fungal friends, sharing pictures, advice, tips and maybe even a few secret spots to help you find baskets of success in 2019. Learning to hunt wild mushrooms is easier than you might think! Learn how to find buckets of morels in last year’s burns by locating the right terrain, elevation, aspect and forest types. Forest fires are a tragic event, but there is a silver lining. As the forest regenerates in the years following a burn, morels grow like crazy in the charred terrain. Learn how to locate and collect these choice edible fungi in Western Colorado. Special attention will be given to online maps and pre-foraging research. Trent and Kristen are passionate foragers that travel around the United States searching for edible mushrooms. Based in Glenwood Springs, they especially like searching for wild mushrooms in the Grand Mesa NF. They are the authors of Burn Morels of the Pacific Northwest (2019 maps + update coming soon!) and are certified by the State of Colorado as Mushroom Identification Experts. Can’t wait….I’ve been looking for someone over here on the western slope to teach me. I’m retired and spend a lot of time in the woods in the fall. See you at the Expo. Steve Bramble. We will look forward to meeting you! Are there mushrooms out this early or is this more of a classroom workshop to prepare you for foraging season? Thanks! In Colorado, not quite yet… we have to wait until springtime for morels. Then our main season begins mid-July in the mountains. There are two talks – a 101 on CO mushroom hunting and another specific to hunting burn morels. Both just classroom style to give you tips for the upcoming season. Hope to see you there! I move to Montrose last year and I always hunt mushrooms expecially bolete and chanterelles. I m a really passionate,i also brought from italy my back chest. I wish to go with you foraging in the area when is the season(grand mesa/telluride/ etc..
We will look forward to meeting you someday soon. Hopefully Colorado will bring you as much foraging joy as your native home 🙂 As long as we have rain, the mushrooms here are wonderful. Someday I’d like to hunt in Italy! Thanks for reaching out.